Read our companion page on capacitor ESR effects. Charge storage is used in pulsed systems where the power supplies are "power keyed", and the actual power supply is sufficiently far away from the transmit amplifier that the amplifier essentially runs off the capacitor during the pulse and the power supply merely supplies an average current to keep the capacitor bank charged up. Charge storage is often integrated within transmit/receive modules, or located nearby. Charge storage capacitors are nearly always tantalum electrolytics, because high-density capacitance is needed. These caps have a polarity that you need to observe! OK, let's try out the equation. What charge storage do you need for a 10 microsecond pulse to power a 10W power amp running at 8 volts and 5 amps peak? The next question you have to ask is, what is an acceptable voltage droop? Time for a Microwaves101 rule of thumb! An acceptable voltage droop for a power amplifier during pulsed operation is 5%, which will drop the power by a similar amount (5%, or about a quarter of a dB). 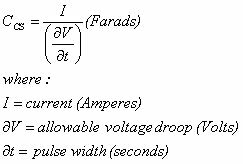 So for a pHEMT amp operating at 8 volts, you allow a voltage droop of 0.4 volts. Back to solving for the required charge storage. The answer is that you'd need 125 micro Farads. When you are picking out the capacitors, be sure to get caps that have voltage rating of double what the system runs at if you want to sleep well! Also, notice that the voltage rating decreases when you consider operation at high temperature. Now click here to go our page on charge storage capacitor dissipation (new for December 2018).